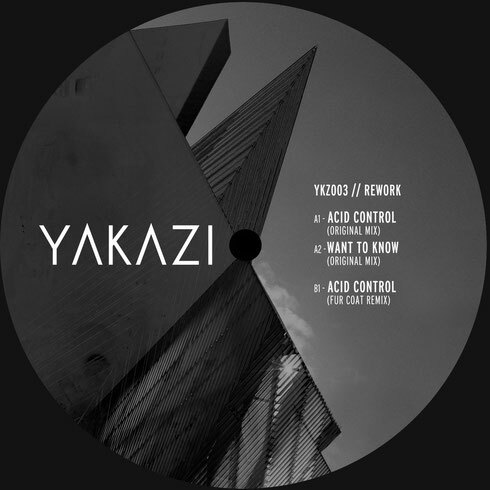 Following on from their second release by Russian producer and DJ, Tripmastaz, the fledgling Barcelona based label Yakazi Records, drops another EP, this time saturated in acidic 303 lines and crisp 808 percussion by German trio, Daniel Varga, Michael Kuebler, and Sascha Hedgehog, aka Rework. Having released on Visionquest, Playhouse, Items&Things, Meant, Loveyeah and more, the group continue to reinvent their fresh and funky rei-maginings of new wave disco and delve further into sonic explorations. Formed in 2000, Rework released their first EP ‘Anyway I Know You’ on Playhouse Records. Several years later, Sascha Hedgehog formerly of French Beat-Punk band Les Quitriche, joined the team. Not long after, their first album ‘Fall Right Now’ followed and club hits including ‘You're So Just Just’ and ‘Love Love Love Yeah’ helped pave the way for them further. Their second LP ‘Pleasure Is Pretty’ was released in 2007 and remix projects with Alter Ego, Chloe, Magda, Losoul, Jackmate, Trentemoller and others followed. Their musical aesthetic has changed over the years from, in their own words, ‘cabaret-independent-house,’ to forging a distinct sound that combines icy minimal structures with catchy euro-girl vocals, Anglo-French funk antics and a dash of dancefloor melancholy. With ‘Acid Control’, the trio see themselves in even darker territory than before, making things much more intense. The release is topped off with an Aphex-esque remix from Venezuelan duo Sergio Muñoz and Israel Sunshine aka Fur Coat, which pairs deep, dark driving beats. Unearthed by Crosstown Rebels boss, Damian Lazarus, in 2010, they were promptly signed up for their debut EP however it wasn’t until they released ‘You And I’ that put the name Fur Coat on the tongue of weekend warriors across the universe. Throughout the past few years they have provided remixes for labels such as Culprit, Get Physical and My Favourite Robot, and played at some of the finest venues across the world including Warehouse Project (Manchester), DC-10 (Ibiza), Day Zero (Mexico), Verboten (New York) plus many more.